The Olive & Clyde Blog: What are we doing and why? So, you're on our website, huh? I have to admit I'm a little embarrassed. It doesn't look like much at the moment -- we're still working on our coding skills and setup -- so just ignore that for awhile. The important thing is that we have FOUR cards in our Etsy store. And you can BUY them. Like we're a REAL company that SELLS THINGS. We're extremely excited. As we continue to work on products (and the website) for our official launch in a couple months, I thought it might be a good idea to take some time here and explain what we're doing and why -- and to let you know what's coming! There are a lot of different reasons, but really it comes down to one simple idea: creating. Do you know how much fun it is to create something? Really. Think about when you were a kid and you got to make stuff in art class. I made this really ugly wooden box with asymmetrical sides in 4th grade and painted each side a different pattern. I said it was "modern." It was hideous. But I took it home and kept my Ace of Base cassette tapes and random junk items in it, and it was the best. I was a creator. Moriya and I like to make things, and we have fun working together. We've done it in our day jobs for years, and there's nothing like seeing something you create, something that was born inside your brain, come to life, whether it's a website, a marketing campaign, or a greeting card. It's fun. If what you create somehow helps people or serves a need, that's even better. We found ourselves talking about this idea one day at lunch, and suddenly we were making plans. Suddenly everything came together. Of course we would start an Etsy store. Of course we would name it after our dogs. Of course we would design greeting cards. After all, at the heart of it, what is writing and design (our strengths) but a way to communicate? What are greeting cards but a way to communicate with people you care about at the biggest moments in their lives? And so Olive & Clyde was born. It's our place to play around and create -- and hopefully come up with products that people will enjoy and have fun sending. 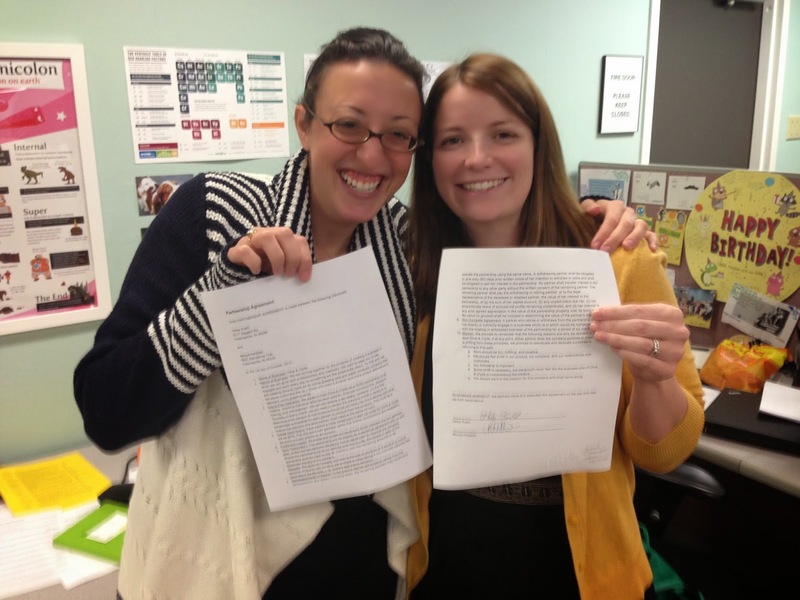 Moriya and I after signing our partnership agreement. Exciting! 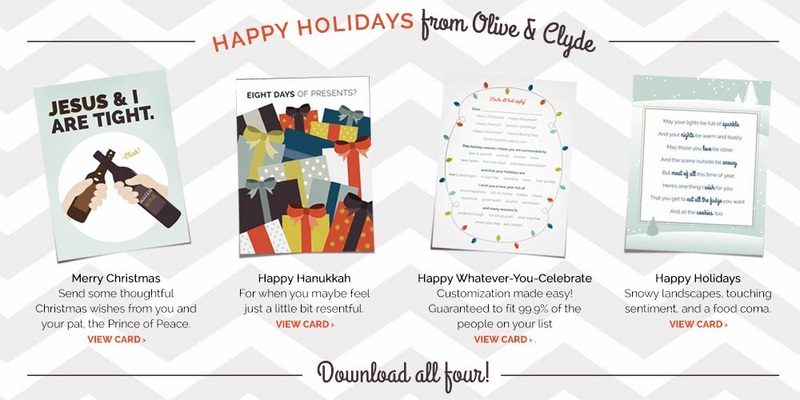 What will you be able to buy from Olive & Clyde? At this point, we just have print-yourself cards available, but with our official launch, you'll be able to buy unique, already-made cards that we'll ship right to your door. We're currently designing cards for birthdays, Valentine's Day, Mothers'/Fathers' Day, and more. 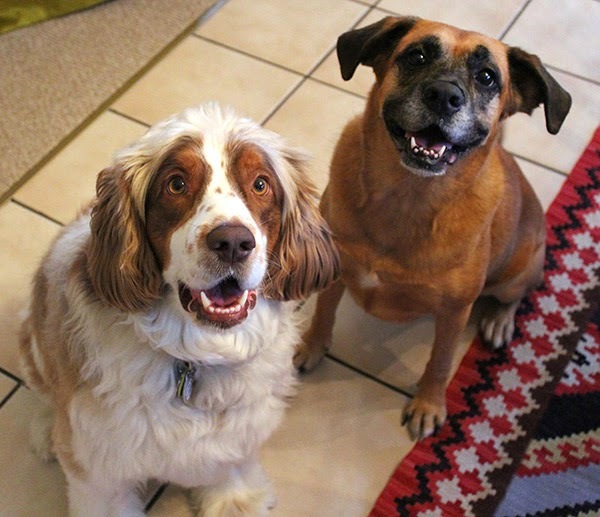 If you checked out our About Us on our Etsy Store, you already know our dogs (okay, and the rest of our families) are important to us -- enough so that we actually named our company after them. So we'll be blogging about Olive and Clyde as we go, as well as any random bits of our personal lives we want to share. We'll also write about topics like proper "thank you" card etiquette and good places to hide "I love you" notes. You're excited already, aren't you? When will we officially launch? Our plan right now is to officially launch in January of 2014, but that plan really depends on how much time we find to work on cards during the holiday season. If you follow us on Facebook, Twitter, or through our mailing list, we'll keep you posted! So, that's it for now. We're glad you took the time to check us out and hope you'll be back -- even if our site isn't the fanciest. In the meantime, remember to take a look at our holiday cards and let us know what you think!